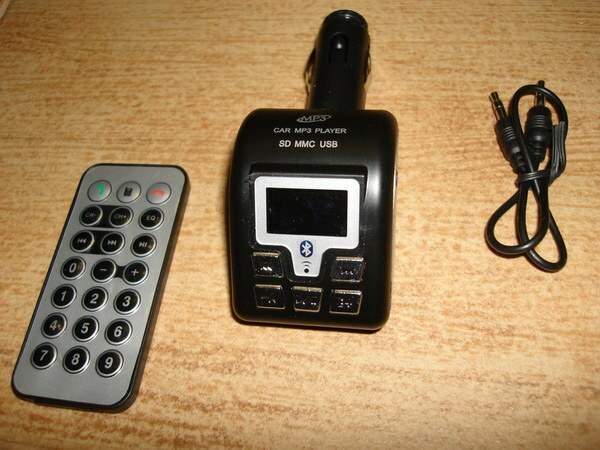 Car fm modulator is a decoding device that is able to convert and stream music from a memory card or USB flash drive. In most cases, a fm modulator, you have given the range of variable frequencies, although there are models with fixed transmitters on a frequency band of broadcasting. Correctly set the fm modulator is simple: insert the transmitter into the lighter socket. Then put on a modulatore frequency. Finally, set the stereo to put on a modulatore frequency and enjoy listening to music. Of the fm modulatorand you can make a great MP3 USB player, with radio you do not need. The first thing to remove from the panel ashtray: this place will be the speakers. Cut the plug from the computer cord in the hole through which the stretched walking out of the cabin to the bonnet wire, thread the cord. Connect the cord to the battery. In the end it should look like this: one end of the cord should be attached to the cigarette lighter, and the second to the battery (it is desirable that the connection was made using the fuse). Disassemble the column. Speakers install in the hole from under the ashtray and solder to them wires (you can use even those wires that used to connect speakers to the computer). In the end, if you did everything correctly, it should be equipped with two speakers, from which hangs a wire with a jack. Disassemble the lighter and with a file make a notch under the wire. Then straighten the "whiskers" in the nest. Solder the wire to the body of the cigarette lighter, then the body gently wrap with electrical tape. Then carefully grind the teeth of the outer cylinder (the body of the cigarette lighter) and wrap and this region several layers of duct tape: generally there should be no contact with the outside zero. Disassemble the old power supply: you need the inner part. Taken from the power supply "filling" will act as a filter that protects the device from interference which may be caused, for example, the operation of the generator. The filter will consist of coil, capacitor and connecting terminals. To the input of the amplifier solder the wire with the mini jack: this will give the possibility to connect to an amplifier fm modulator. Then in the nest the modulatorand make using a conventional wire jumper wire: this is necessary in order to soviani the minijack was used for the signal transmission and not reception. Place under a panel, an amplifier and a filter, and then connect all the wires (for power supply with lighter socket and power) colors, that is, the pros to the pros and cons by cons. Connect the speakers to the amplifier and posledni connect to fm modulator (all connecting wires hide under the panel). Then turn on the amplifier, plug in fm modulator USB flash drive with the songs and hit play: the excellent music you provided. Using a soldering iron, observe the safety regulations! Functionally distinguish between fm modulators with internal memory, the mode of operation from the built-in device battery life, can play video files as well as with a Bluetooth option.